Clinger Holsters has made a truly unique concealed carry holster for outside the waistband use. It’s the most concealing SIG P320 XCOMPACT OWB holster you’ll find. The Ultra-Conceal OWB is so concealing because it utilizes our Cling Tab system. To illustrate, the Cling Tab system uses two tabs that attach the holster’s belt clips to the Kydex shell. One tab is flexible and one is stiff. The Flex Tab allows the holster to flex around your waistline while the Cling Tab pulls the grip of the weapon in extremely close to your body like a lever. In addition to making the holster very concealing, the Cling Tab system allows us to keep the footprint of the holster extremely small. A small holster is more desirable than a bigger holster in more ways than one. For instance, big holsters are uncomfortable. Even one extra inch of plastic on your holster makes it more likely to press into your kidney or other sensitive area. In particular, bigger holsters have more chances to poke or prod you somewhere. Considering this, Clinger Holsters makes our SIG P320 XCOMPACT OWB holsters as small as possible. Our Ultra-Conceal OWB is barely bigger than your P320 XCOMPACT. In addition to being an amazing OWB holster, the Ultra-Conceal OWB converts into different SIG P320 XCOMPACT holsters. It easily converts into the No Print Wonder or Stingray. To convert it into the No Print Wonder, just remove the OWB belt clips from the back tabs. Next, just attach the IWB clips to the front of the tabs. It really is that simple. 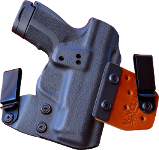 If you want to use the holster in the appendix carry position, simply remove the Flex Tab and Cling Tab from the Kydex shell and attach the Stingray belt clip. Therefore, the Ultra-Conceal OWB gives you 3 different holster types to carry your P320 XCOMPACT. Our Kydex shell is very form fitting. It fits your pistol exactly. For example, you’ll notice a very close fit and a click when you holster your handgun. At Clinger, we believe a custom fit is an extremely important step in making the perfect SIG P320 XCOMPACT OWB holster. For instance, a loose holster will cause your handgun to wiggle around in the holster. That won’t conceal as well and won’t function as well. The Ultra-Conceal OWB is ambidextrous as well. It can be easily worn on either side of the waistband. The full sweat shield on both sides protects your firearm from corrosive sweat. Plus, you’ll be happy that the gun’s sharp edges on resting on your skin. Every SIG P320 XCOMPACT OWB holster we sell comes with a Two Week Buy Back Guarantee and a Lifetime Warranty.